This update is slightly behind as these trips were about 2 weeks ago. My excuse is that I was busy upgrading this blog and my instruction website – it was a lot of work! I decided to take an exploratory early season trip to a hill loch that has produced good sized fish for me in the past but I had never fished it before summer. 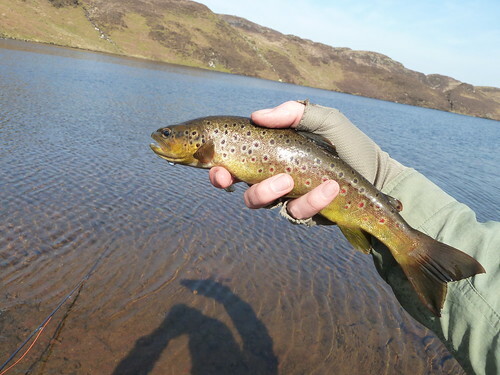 This spring has been particularly mild in Scotland so I fancied my chances of there being a hatch and some rising fish moving – hopefully big ones. The weather was fantastic, reasonably light winds and brilliant sunshine and to my surprise when I arrived at the loch there were a good number of sepia dun spinners (Thanks to my friend Jim at Palewatery for the ID) buzzing about in the air. This alone made the hike in worthwhile, not to mention the outstanding scenery. Having quickly had enough to wooly buggering I figured it was best to cut my losses and make my dinner. The sun was beginning to head down over the hills, my trangia was bubbling away with my dinner and that first rise that heightens the excitement sipped down a fly straight in front of me about 200′ away. Not an issue, they come in much closer as evening rolls on. Eventually dinner was over, the light was hitting that magic level just as the sun disappears and the cruising fish could be seen by following their rises. It’s hard fishing but it’s great fun. I eventually hooked into a good fish but the dam thing slipped the hook. I’ve got a video of this I’ll get around to posting, there’s nothing quite like the trashed water settling down again and you console yourself with a few profanities! I’m trying to keep this write up brief so I’ll rattle on with day two. I was up around 8am which is unheard of for me but nothing was doing so I nodded off again until around 10am. This time there were fish rising so I had a quick bite to eat grabbed the rod and went off in pursuit. A small klinkhammer fooled a few fish but unfortunately none the size of the lost one the night before. 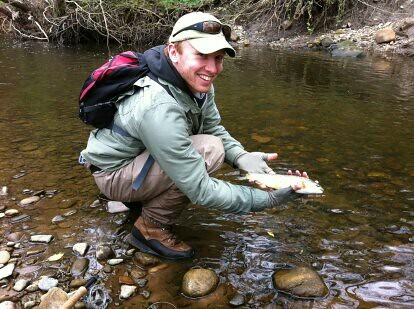 Nice fish all the same though, and catching rising fish on a loch high in the hills in March shouldn’t be sniffed at! 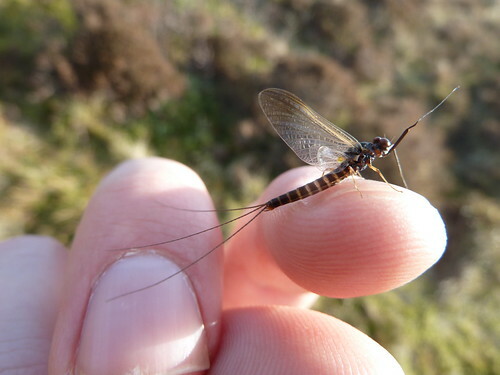 I’m going to write an article soon on dry fly fishing on lochs on flat calm evenings – just a change in methods that can bring back a new level of excitement. Stay tuned for that! I’ve had a few trips to the river with a few friends but there hasn’t been much to write about. Short lived hatches and the odd good fish. 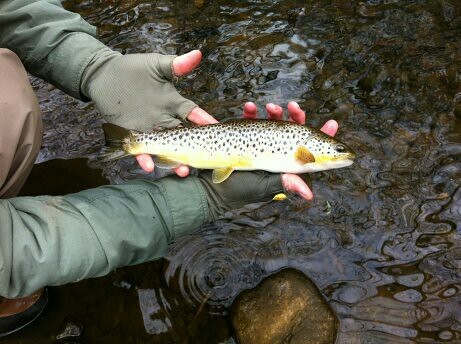 A new one for me though is small stream fishing. Jim and Craig have got me out small stream fishing with 6′ and 7′ rods, the 7′ cane rod is gorgeous by the way and typically I hate slower rods but what a tool for the job that is! 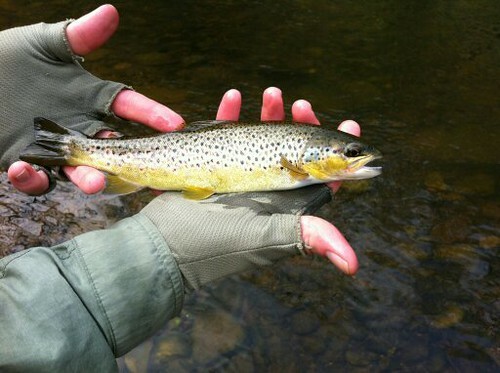 The small streams present such an interesting challenge, quite often you come across a fish that you might typically shrug off as impossible to get to but with a bit of thinking and a bit of cast manipulation. 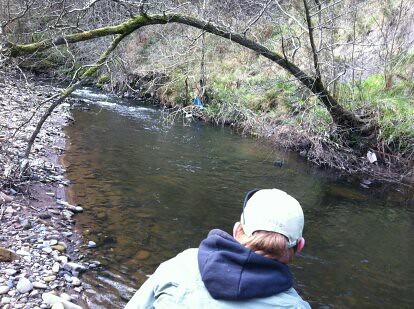 I’ve been having a great time fishing this stream.